The Andaman and Nicobar Islands located in the Indian Ocean is one of the seven union territories of India. It is famous across the world for holding many stunning islands in the Bay of Bengal. 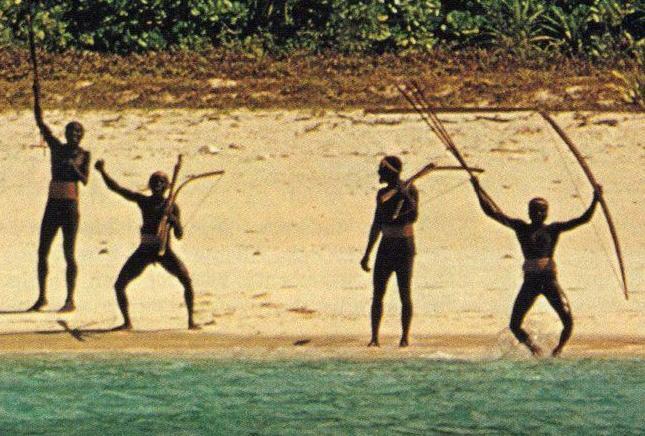 The North Sentinel Island is one of the Andaman Islands' groups situated in the west of the town of Wandoor in South Andaman Island. It has a heavily forested area of 23.04 sq mi surrounded by coral reefs. The population of this place is estimated to be 40 individuals according to a 2011 report. The people live in here are called Sentinels or Sentinelese. They are virtually untouched by the modern civilization and isolated from the outside world for almost 60,000 years. Sentinels are known to be the most dangerous tribe in the world because they attack visitors and kill them with bows and arrows. They do not tolerate any outer interference in their place. Sentinels are black and dwarf. If a newborn becomes any fairer amongst them, they kill that child supposing it to be an outsider's child. Today, the Indian government recognizes the island as a sovereign entity and makes efforts to ensure they are left undisturbed. This place is banned for the visitors.